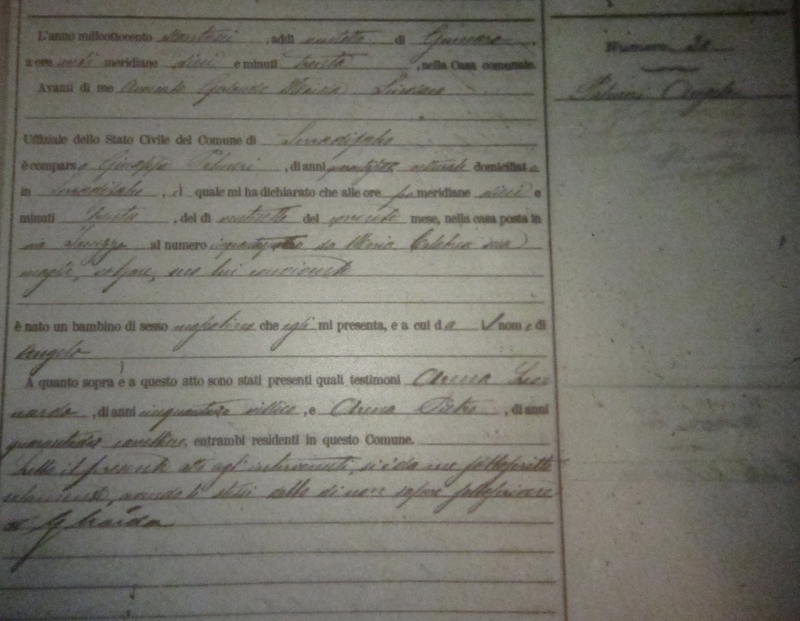 My grandmother's birth certificate arrived today from Montemaggiore Belsito, Sicily, Italy. It only took a month to come. Much quicker than what I heard from folks online about getting records from Italy. vr@health.state.ny.us is the email address. 518-474-3055 they will email you documents. I have attached the affidavit for the Death Certificate. 1. The bride or groom may request his or her own marriage record. The record will be sent to the requestor who may then give it to the applicant for dual citizenship. The requestor must include a copy of his or her identification. 2. The bride or groom may request his or her own marriage record and include a signed and notarized letter stating that he or she gives the department permission to send the document to the applicant for dual citizenship. The requestor must include a copy of his or her identification. 3. If the applicant has power of attorney (POA) for the bride or groom, the applicant may request the record. The POA must be signed by the bride or the groom on the marriage certificate. The language stated in the POA must be sufficient to allow the person given POA to obtain the marriage certificate. Applicant must include a copy of the applicant’s identification along with the power of attorney and completed application. 1. A completed Marriage Certificate application form (see attached) along with a check or money order for the appropriate fee. 2. A photocopy of your identification (see application for identification requirements). 3. Photocopies of the death certificates of both the bride and groom on the record. If they died in New York State outside of New York City and you do not have copies of the death certificates, please provide the town, city or village where they died, name at the time of death and the dates of death. 4. A completed, signed and notarized Affidavit to Request Certified Copy of Marriage Certificate (see attached DOH-5000). b. A separate check made out to the Department of State for $10.00 for each document that requires an Apostille. NOTE: Submitting a false affidavit may result in prosecution for perjury. Please use this application only if the marriage license was issued in New York State outside of the five boroughs of New York City. Marriage records for licenses issued in New York City are not available through the New York State Department of Health. 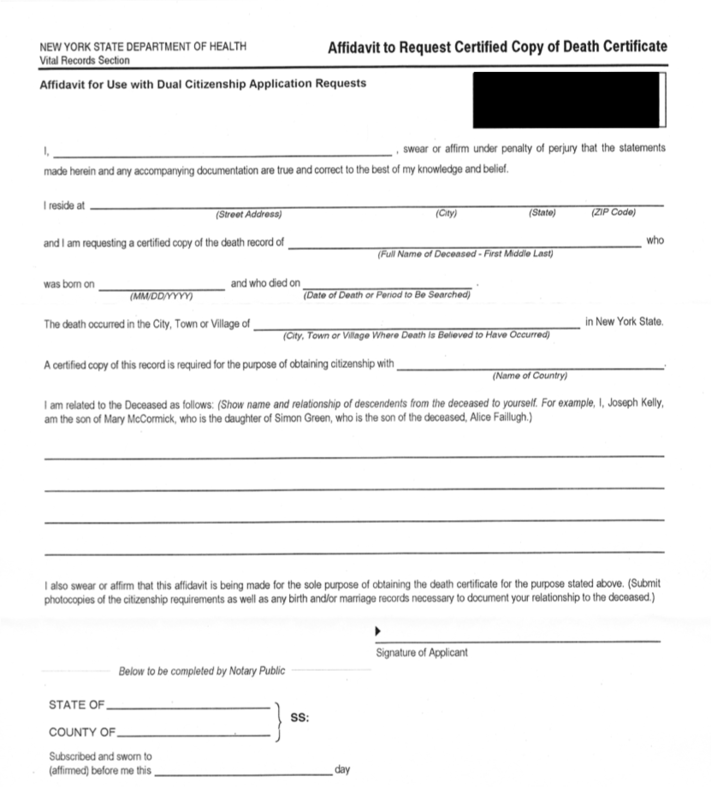 The applicant must include along with the application for a death certificate, a completed and notarized Affidavit to Request Certified Copy of Death Certificate, documentation demonstrating relationship and a copy of his or her identification. – certificate of residence of the applicant. – Police Clearance or Certificate of criminal records, issued by the central authority of each state of which the applicant has been a resident since the age of 14, accompanied by a translation into Italian. – F.B.I. Clearance with finger prints form (in addition to the above certificate/s), with translation into Italian. The fee must be paid prior to the presentation of the request, through international bank transfer or through Eurogiro network. Beneficiary: CONTO CORRENTE POSTALE "MINISTERO DELL'INTERNO D.L.C.I. – CITTADINANZA"
a. For citizenship by marriage please indicate: "ISTANZA DI CITTADINANZA PER MATRIMONIO"
b. For reacquisition of citizenship please indicate "ISTANZA DI RIACQUISTO CITTADINANZA"
c. For renouncing Italian citizenship please indicate "DICHIARAZIONE DI RINUNCIA ALLA CITTADINANZA"
Poking around Italian Citizenship Message Board today and saw this: "They were both married in Pennsylvania, which does not record marriages at the state level. When we originally requested these certificates from the county courthouse, the county clerk ASSURED us that the marriage certificates provided to us were the only official record of marriage. As my husband feared, the certificates lacked certain information. The consular officer nearly laughed out loud when he saw how short they were. Specifically, he said that the certificates needed to show parent's names and information of any previous marriages (or a statement that there were none)." I now realize that our marriage certificate is a "short form" from the City of Tonawanda. I need to apply for a long-form from NY State. Another $30. 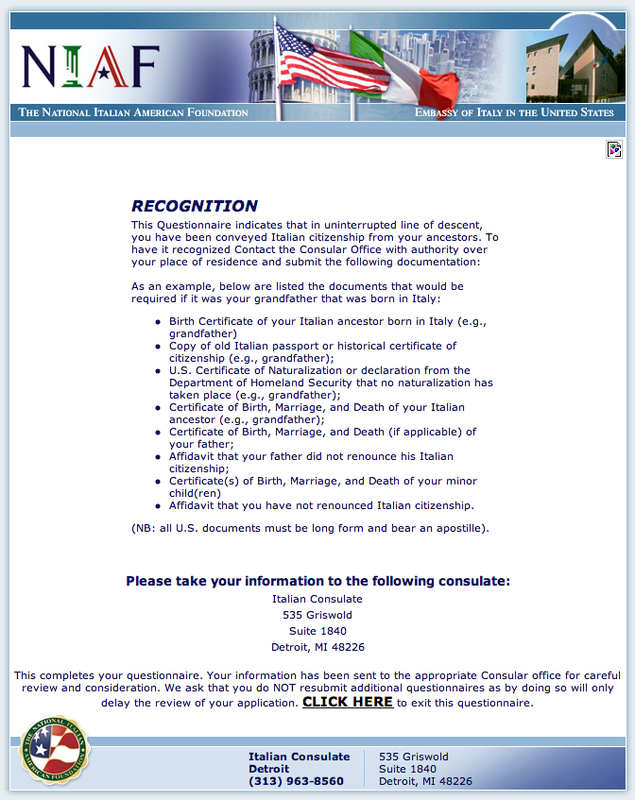 I will need to get several US documents translated into Italian (various birth, marriage, and death certificates). Even though I am going through the Detroit consulate, I will need to get several of my NY documents authenticated by the NY consulate. Detroit does not seem to have a list of approved translators, but NY does. So I think I should pick a translator from their list. I'll be emailing them to get a sense of the cost for their services. I've heard up to $50 per document, though some have noted prices half that. Fingers crossed. 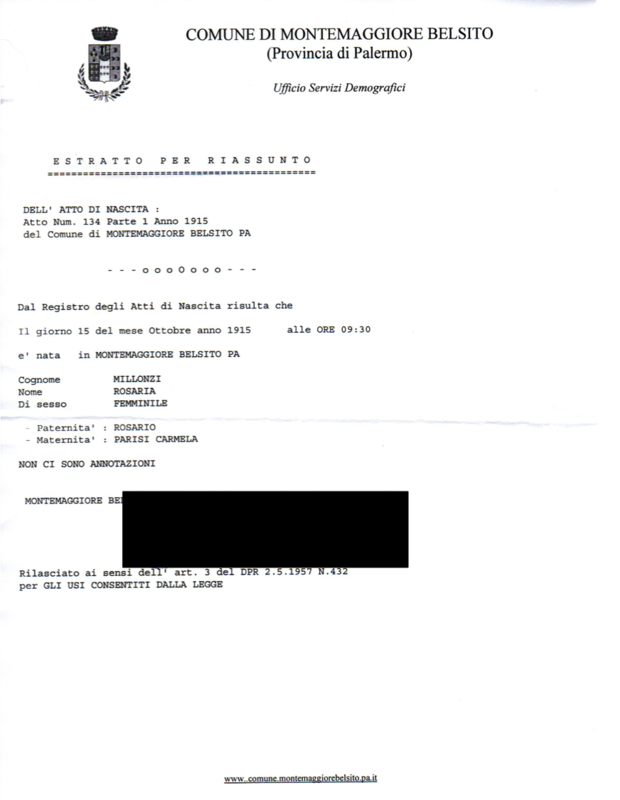 Looking at the Italian Citizenship Message Board, I see that some consulates require, e.g., "to have the translator certify the accuracy of the translations and to get the translator's certification notarized and apostilled" … "it was necessary for the translator to be a licensed translator, who could certify the translation (which certification would then be notarized and apostilled)" … "Documents on the line of descent originating in states outside of the jurisdiction of the L.A. consulate had to be authenticated by the consulate with jurisdiction over GA and P.R. I hired a wonderful translator in Miami who set-up the appointment with the Miami consulate and took all the docs to be authenticated." Rosanna M. Giammanco Frongia, Ph.D.
Definitely glad I emailed everyone. Some responses were wonderfully detailed and helpful. One refused to respond to anything over email, demanding that I telephone. Another said they wouldn't even give a ballpark until they saw the documents. Gives you a quick glance at how these folks might be to deal with in the coming month. I also learned that the translation part is definitely NOT a bottleneck. Estimates ranges from 3 days to 2 weeks. 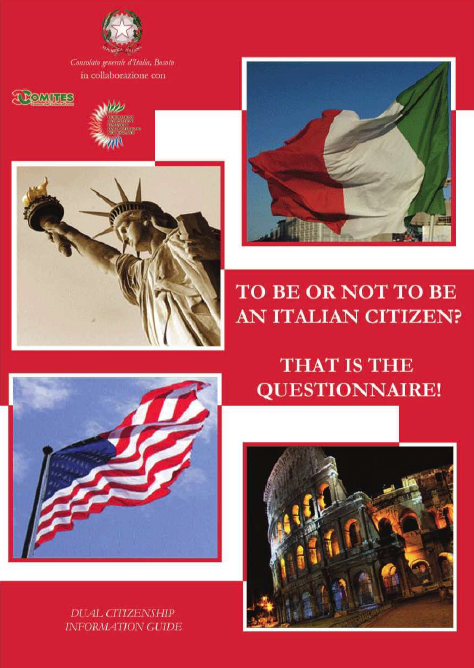 While looking around the web site for the Italian consulate in New York, I found a link to a dual citizenship questionnaire created by The National Italian American Foundation. I suppose it gives me some piece of mind to see that when i fill out their questionnaire, it says I qualify for dual citizenship. All documents from the United States require that an apostille be attached to them. These certify the documents according to international law. A couple of weeks ago, I got apostilles for my sons' birth certificates in downtown Nashville. Today I sent off an apostille request for our marriage certificate from NY State (http://www.dos.ny.gov/corps/apostille.html). This is a trial run to see how quickly the documents are returned. I'll be sending off apostille requests for a number of birth and death certificates in the coming weeks and months as I receive them. On the Italian Citizenship Message Board I found a note that some consulates require a notarized affidavit from anyone living in the chain that they also never renounced their Italian citizenship. I, Joseph A. Palmeri (born — — —- in Buffalo, NY), am the son of Joseph J. Palmeri (born 2 Oct 1911 in Buffalo, NY, died 19 Jul 1967 in Buffalo, NY, husband to Sarina Millonzi, born 14 Oct 1915 in Montemaggiore Belsito, Italy), who was the son of Angelo Palmeri (born 27 Jan 1886 in Serradifalco, Italy, died 29 Sep 1969 in Buffalo, NY, husband to Maria Giambrone, born 12 Apr 1890 in Serradifalco, Italy, died 11 Jul 1972 in Buffalo, NY). I hereby declare that I have never renounced Italian citizenship before any Italian authority. I basically created a similar version of that for myself that I'll get notarized this week. Even though we just received our "official" birth certificates, I just discovered that these could cause problems because they were issued by the City of Buffalo and not New York State. Either at the Apostille stage or at the Italian Consulate stage, these could be rejected because they were not issued by the state. So, we're starting over. Today I'm sending out applications to the NY State Department of Health for full, certified, long-form birth certificates for me and Amy. That's another $30 each, which brings our grand total to $252 and we're only a fraction of the way to the finish line. 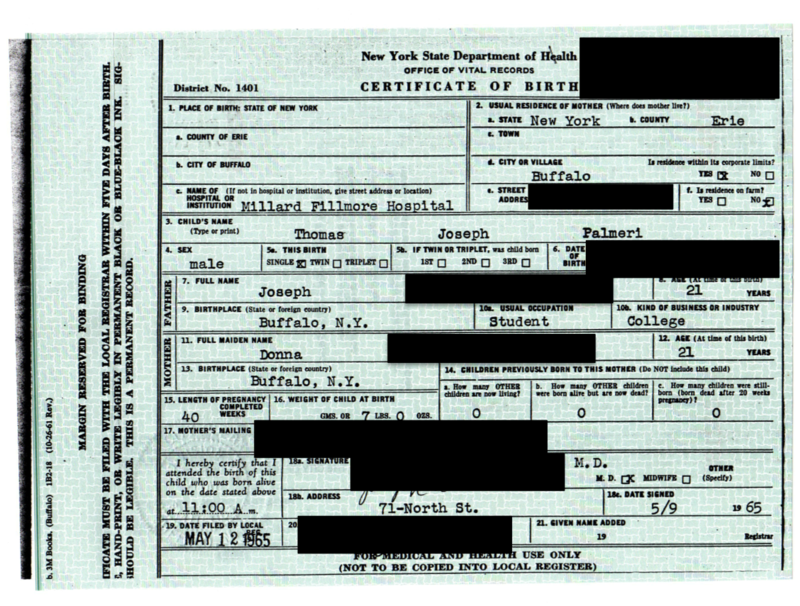 I'm also sending out a request for my mother's birth certificate to NY State. Technically, the only people eligible to receive a birth certificate are the person themselves and their parents. 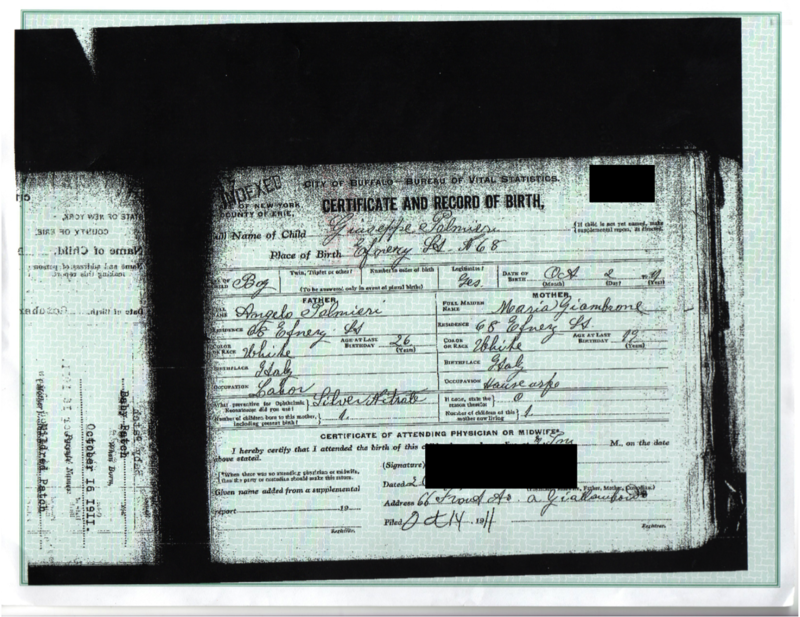 I adapted the form my father got to receive a copy of his grandfather's death certificate to receive a copy of my mom's birth certificate. I'm including copies of my ID, my birth certificate, my mom's birth and death certificates, a notarized letter saying that I am applying for dual citizenship, and a copy of the citizenship requirements from the Detroit consulate. That's another $30. If they say no, we may need to get a court order. We heard back from the NYS Department of Health. My dad had applied to get a certified copy of his great-grandfather's death certificate for dual citizenship. 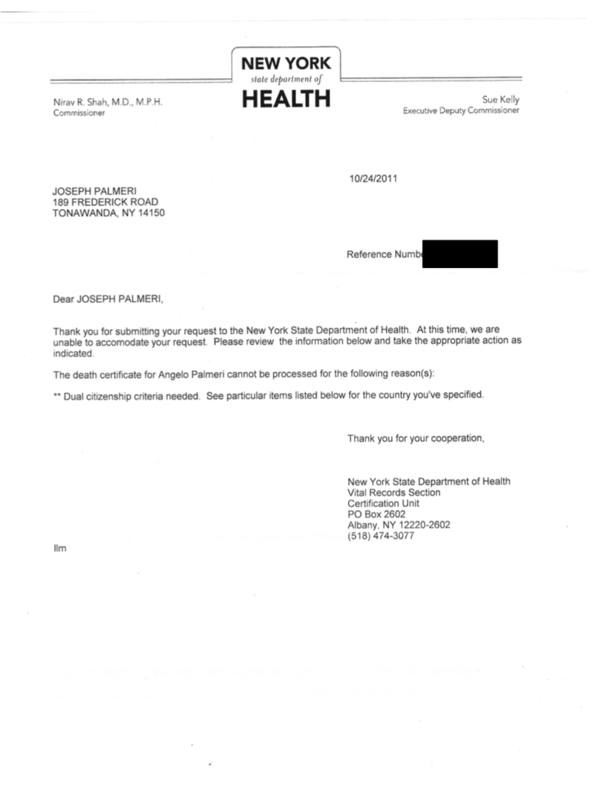 He received a letter and form that needs to be notarized in order for NYS to release the death certificate. 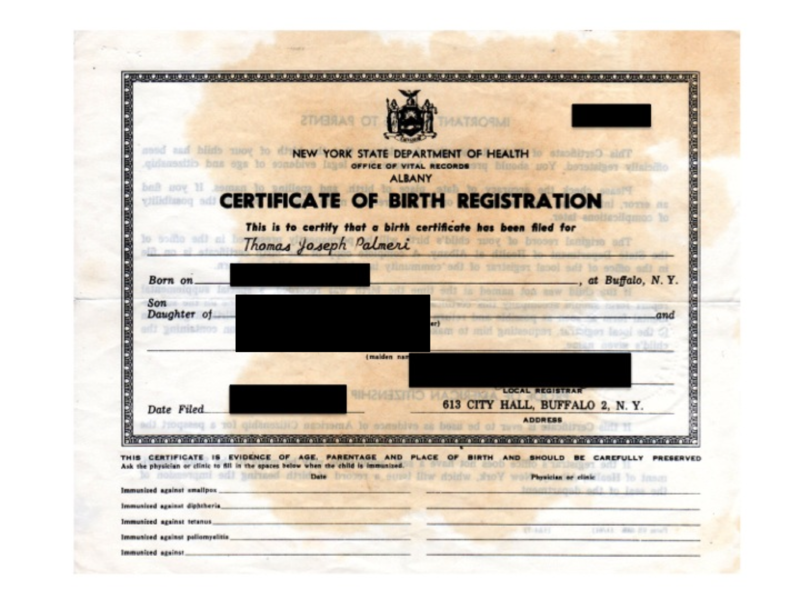 A couple weeks ago, we learned that the birth certificates we used our entire life … to get a driver's license, to get a passport, for everything … were not "real" birth certificates. They were simply "Certificates of Birth Registration". 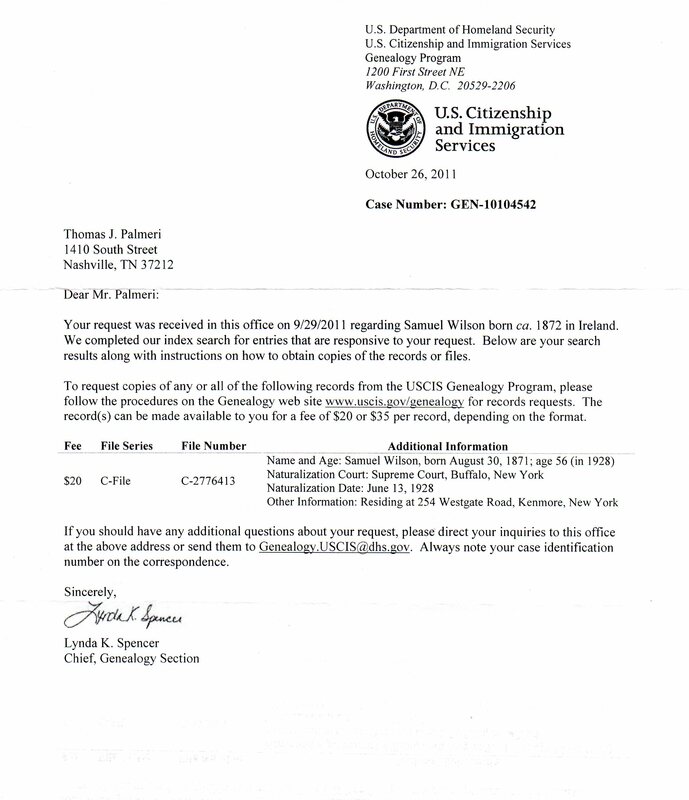 To get dual citizenship, I needed real birth certificates for Amy and I that showed all the detail information, including a signature from the physician. 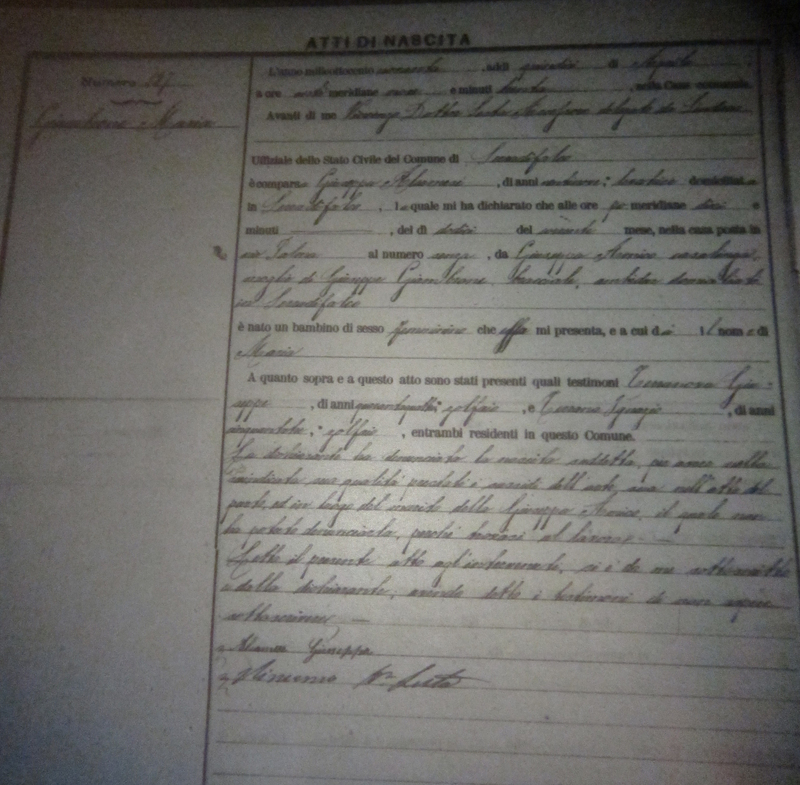 This evening, I searched microfilm of birth records (Atti di Nascita) from Serradifalco and found my great-grandparents, Angelo Palmeri and Maria Giambrone. Not only is this an interesting tidbit, but I needed to make sure that these records could be found in order to apply for dual citizenship. This at least proves that these records existed when the LDS church microfilmed the Serradifalco records. As I noted in a recent post, it looks like my great-grandfather, Angelo Palmeri, came to the US through Ellis Island in 1909 with his sister-in-law, Giuseppa (Baglio) Palmeri, and his nephew, Giuseppe Palmeri. The manifest says that all three were going to join Pietro Palmeri in Yatesboro, Pennsylvania. I originally thought that was simply an error, or that it could be the wrong Palmeri family entirely. But then I found census records for Pietro and Salvatore Palmeri in Buffalo that note that some of their children were born in Pennsylvania as well as Italy and Buffalo. I've now confirmed from marriage records from Serradifalco that this was indeed my great-grandfather, Angelo, traveling with his brother Pietro's wife, Giuseppa (Baglio) Palmeri. A new search on familysearch.org turned up Palmeris in Pennsylvania in the 1910 census in Cowanshannock, Armstrong, Pennsylvania, right outside of Yatesboro. That's coal country and Salvatore, Pietro, and Angelo all list themselves as coal miners. Serradifalco was a major sulfur mining area in Sicily for many many years. Indeed, some of the oldest mines in Sicily are near Serradifalco. As such, many immigrants from Serradifalco came to work in the mining industry in the US. It appears that three of the Palmeri brothers did for a time. Angelo went to Buffalo the next year to marry Maria Giambrone in 1910. It seems that Pietro and Salvatore went to Buffalo a few years later, probably around 1913 or 1914 based on when various children were born in Pennsylvania or New York. Until the turn of the Nineteenth Century, Cowenshannock Township was sparsely populated rolling farmland with no Catholic church. However, the discovery of abundant coal seams in the hills surrounding Rural Valley heralded the opening of coal mines and an exciting new era of change began in the valley. In March, 1899, Lucious Waterman Robinson, president of the Commonwealth Coal and Coke Company, a subsidiary of the Rochester and Pittsburgh Coal and Iron Company, purchased 1000 acres of farmland from millionaire capitalist Adrian Iselan. Robinson’s intention was to open a coal mine, to erect mine buildings and build a company town for his employees. He named the town Yatesboro after Arthur G. Yates, president of the Buffalo, Rochester and Pittsburgh Railroad (BR&P). The rich veins of coal turned out to be very productive and, by 1901, Commonwealth Coal employed 400 men in the Yatesboro mines. By 1913, the number of miners soared to 1075 men who mined more than 825,000 tons of coal yearly. In the early years of production, nearly all of the coal from the Yatesboro mines was sold to George Eastman (the famous camera magnate) who used it to heat his Eastman Kodak laboratories in Rochester, New York. Mr. Eastman and Mr. Robinson were quite good friends and next door neighbors in Rochester. With the opening of the mines, immigrants from Europe began to flood into the area to seek their fortune. Many Italians, Scotch, Swedes, and middle Europeans such as Poles and Czechoslovakians left their homelands to seek the riches promised in America. Not sure what they would find in this new land, many left their families behind in Europe. (The coal company especially encouraged married men to work in the mines as they represented a more stable workforce.) Coming by train straight from New York to Yatesboro, most of the immigrants boarded in the company-owned Valley Hotel until the company built the planned two hundred and fifty single and double houses that would allowed the miners to send for their families. Eventually, Commonwealth Coal and Coke was operating five mines in Yatesboro and the company town grew to include a company-owned store (The Valley Supply), a fine hotel, a pool hall as well as a school (grades 1 – 10) and churches. Many of the European immigrants brought with them their strong Catholic faith and traditions which were a central part of their lives in their homelands. With no church within walking distance, Roman and Greek Catholics began to congregate at Peter Mann’s Hall where the Lutherans also held their Sunday services. (Peter Mann’s Hall was a social hall and pool room located on the site of the present day William Penn club on Main Street, Rural Valley). It was at Peter Mann’s Hall, on August 15, 1901, the Feast of the Assumption, that Father John DeVille, a priest from Saint Anthony’s Church in Walston, Jefferson County (Diocese of Erie) gathered the Catholics together to celebrate their first Mass. How is my name spelled? My father always told me that it was originally spelled "Palmieri" but that in the 1930s or so one of my great-grandfather's nephews had everyone change their names to "Palmeri" in an effort to make it sound less Italian. In fact, my grandfather's birth certificate has all the names as "Palmieri". But as I've accumulated more records, it's become apparent that the occasional early use of "Palmieri" is probably because my great-grandfather and great-grandmother were illiterate when they came to the U.S. The Ellis Island records all list the names as "Palmeri", not "Palmieri". And when I asked my dad's cousin about the name originally being "Palmieri" he denied that based on what he knew. 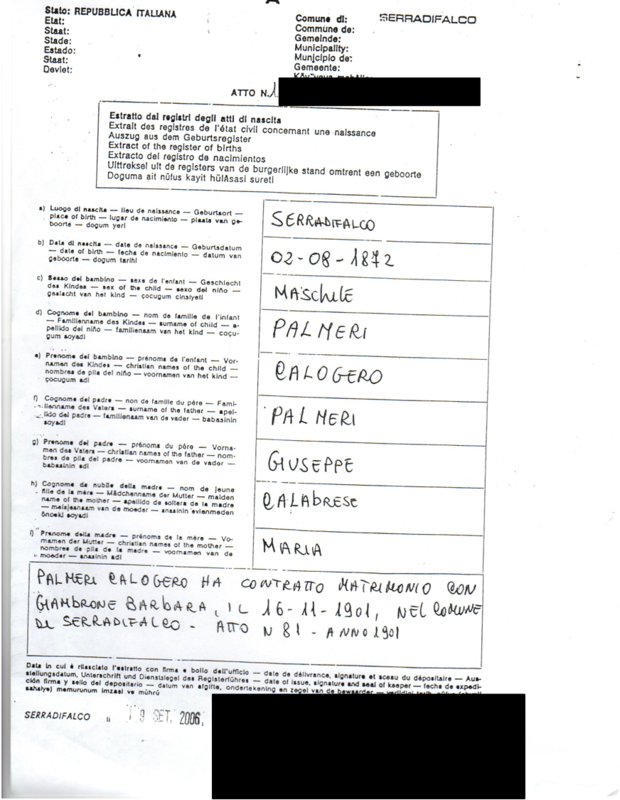 The birth record for his grandfather, Calogero Palmeri, that he obtained in Serradifalco, spells the name "Palmeri", not "Palmieri". 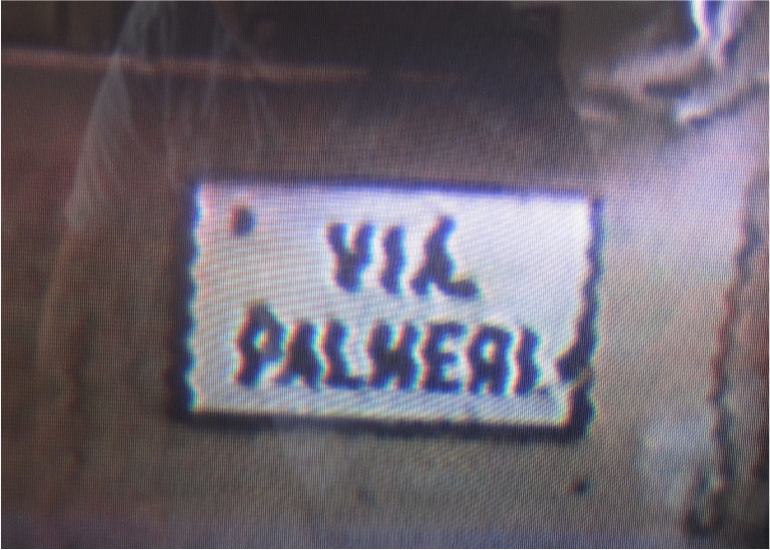 In addition, while there are apparently no longer any Palmeris in Serradifalco, there is still a street Via Palmeri in town. The image is fuzzy because this was a picture taken off of a TV set showing a VCR tape. The one new piece of information is that all of my documentation, if issued in other States, must be presented to this office, duly certified by the Consulate in the jurisdiction where the certificates were issued. It notes: Vital statistics certificates (birth, marriage, death, etc.) that occurred in the United States of America in relation to Italian citizens must be registered at the City Halls in Italy. The registration will be processed by the Consular Offices. In order to do so the certificates must be submitted to the Consular Office that has jurisdiction over the State in which the events occurred, in certified copies issued by the competent County Clerk Office and legalized with the “Apostille”. 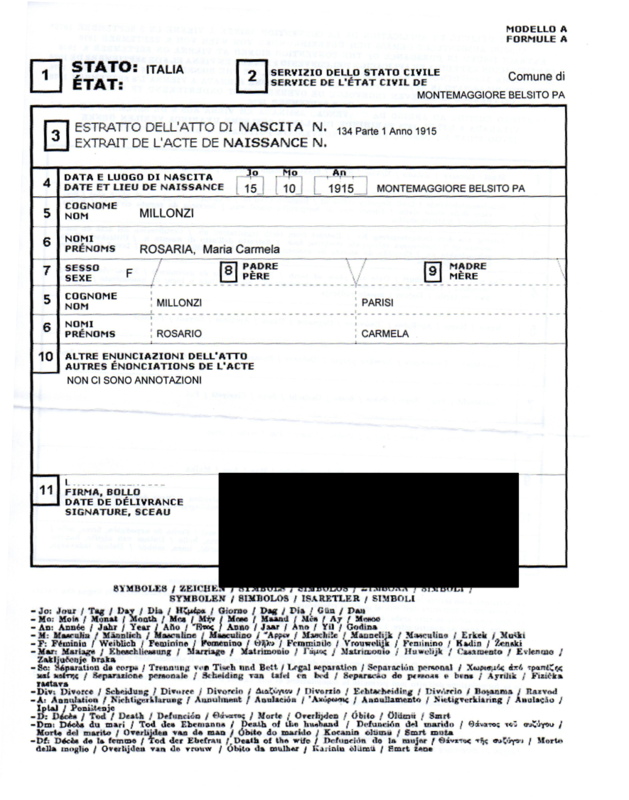 Simple photocopies or certified copies issued by the local registrar are not valid for registration in Italy. From various census records, and because my grandfather was born in the US in 1911, I knew that my great-grandfather came to the US sometime between 1904 and 1910. 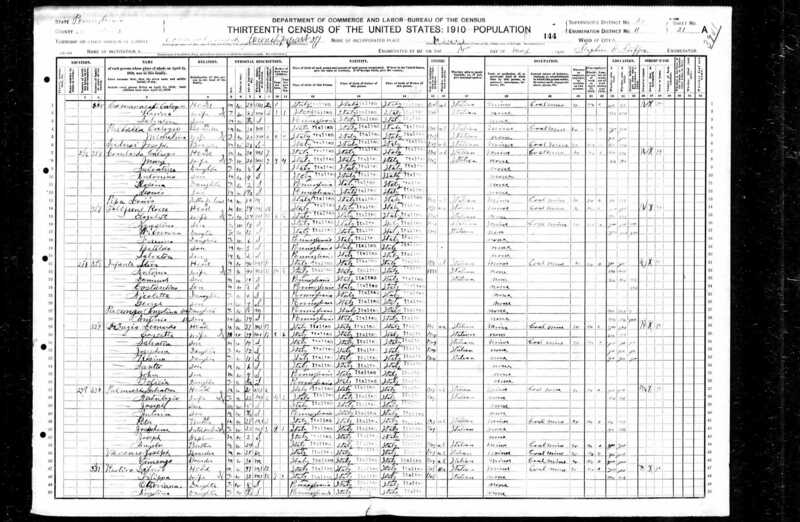 The 1920 census said 1907 or so, the 1930 census said something like 1904, but it was hard to read. I had no luck at all finding his immigration record on ancestry.com. 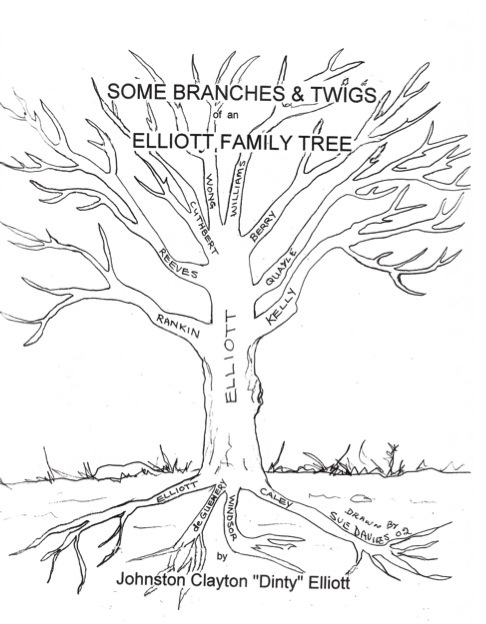 I was reading a genealogy book and was reminded about ellisisland.org. I suppose I always figured that it was just the free version of what I was already paying for with my occasional ancestry.com subscriptions. I should have realized that these are independently transcribed and indexed, so it was quite possible to find something on one and not on the other. Sure enough, with a search I found my great-grandfather, Angelo Palmeri. "Italia" : Built by D. and W. Henderson and Co Ltd, Glasgow, Scotland, 1903. 4,806 gross tons; 400 (bp) feet long; 49 feet wide. Steam triple expansion engine, single screw. Service speed 14 knots. 1,420 passengers (20 first class, 1,400 third class).One funnel and two masts. Steel hull with two decks. Built for Anchor Line, British flag, in 1903 and named Italia. Mediterranean-New York to 1922 service. Later Glasgow-New York service. Scrapped in 1923. Interestingly, it lists him as "single" in 1909. That means that he came the US in May 1909, married my great-grandmother Maria Giambrone when she came in June 1910, and my grandfather Joseph Palmeri was born in October 1910. Angelo was traveling with his sister-in-law, Pietro Palmeri's wife, Giuseppa (Baglio) Palmeri, and his nephew, Pietro's son, Giuseppe Palmeri. The manifest says Angelo was joining his brother Pietro too. Until this past summer, I never knew that my great-grandfather had a brother Pietro, so if I found this before, I would have just rejected it out of hand. 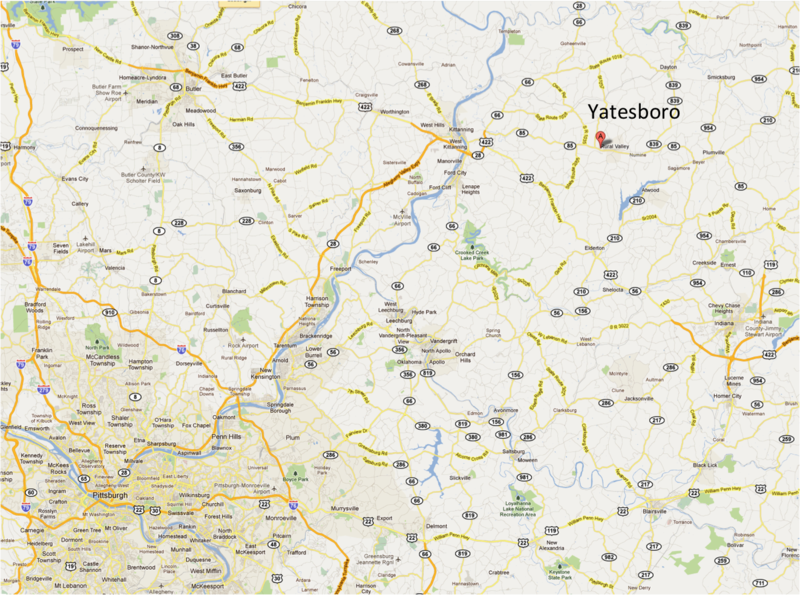 The manifest goes say that they are going to "Yatesboro, PA". Originally I just chalked that up to the immigration officer continuing ditto marks from the people above them. Those listed above him were also from Serradifalco, so he probably assumed they were all going to the same place. But now I'm a bit uncertain. On the 1920 and 1930 Census, when I found both Pietro and Salvatore and their families, it notes some of their children having been born in Pennsylvania. It could well be that those two brothers spent some time in Pennsylvania (possibly Yatesboro), had some children born there, and later moved to Buffalo. Serradifalco was a sulfer mining community, and a number of immigrants from there went to work in mines in Pennsylvania. I found some things online that indicated that Yatesboro had coal mines in the early 1900s that were run by the Cowanshannock Coal Company. So, it looks like my great-grandfather first went to Yatesboro, Pennsylvania, where his brothers Pietro and Salvatore were, possibly working in the coal mines, before heading to Buffalo to join his brother Calogero. My great-grandmother, Maria Giambrone, arrived 24 June 1910. She was going to stay with her sister, Barbara Giambrone, and her brother-in-law, Calogero Palmeri, at 174 Terrace St. in Buffalo. 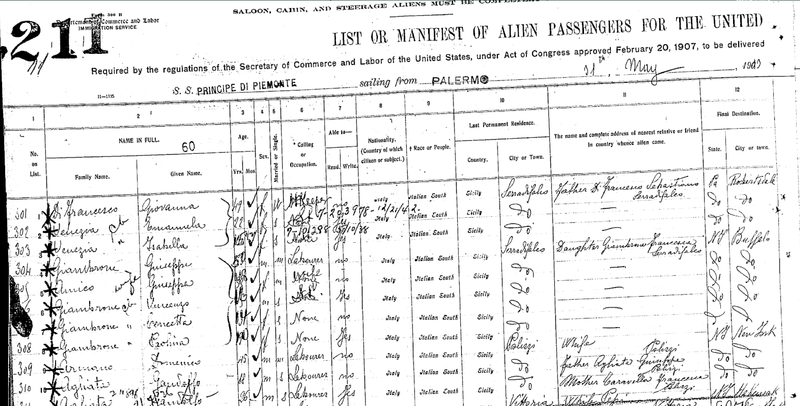 Also on ellisisland.org, I found that brothers Pietro and Salvatore Palmeri arrived 30 June 1907. They were going to join brother Calogero who was living at 174 Terrace St. in Buffalo. The manifest also lists father Giuseppe in Serradifalco. They arrive on the "Perugia". It may well be that after joining their brother they went to work in the coal mines for several years in Yateboro, Pennsylvania. "Perugia" : Built by D. and W. Henderson and Co Ltd, Glasgow, Scotland, 1901. 4,438 gross tons; 375 (bp) feet long; 47 feet wide. Steam triple expansion engine, single screw. Service speed 13 knots. 1,170 passengers (20 first class, 1,150 third class).One funnel and two masts. Steel hull with two decks. Built for Anchor Line, British flag, in 1901 and named Perugia. Mediterranean-New York service. Torpedoed and sunk by a German submarine off Italy on 3 December 1916. I also found Maria's father, my great-great-grandfather, Giuseppe Giambrone, and her mother, my great-great-grandmother, Giuseppa Amico Giambrone. They arrived Jun 13, 1913, out of Palermo, on the "Principe di Piemonte". They were going to daughter Grazia (Grace) Giambrone at 68 Efner St., Buffalo, NY. He was listed as a laborer. They were also traveling with two of their daughters, Concetta and Paulina, and their son, Vincenzo. "Principe di Piemonte" : Built by Sir James Laing & Sons Limited, Sunderland, England, 1889. 6,560 gross tons; 430 (bp) feet long; 52 feet wide. Steam triple expansion engines, twin screw. Service speed 14 knots. 1,960 passengers (60 second class, 1,900 third class).Two funnels and two masts. Built for Lloyd Sabaudo, Italian flag, in 1889 and named Principe di Piemonte. Italy-New York service. Sold to Uranium Steamship Company, in 1914 and renamed Principello. Rotterdam-New York service. Sold to Cunard Line, British flag, in 1916 and renamed Folia. Only one trip Avonmouth to New York service. Torpedoed and sunk by a German submarine off the Irish coast. on February 11, 1917. I thought we were all set with probably the simplest part of our application for dual citizenship: birth certificates for my wife and myself. Well, my wife informed me that we only have short form certificates. She learned this when she went down to the local social security office to get an error corrected on her records. It turns out they wouldn't accept her birth certificate. While it was an official copy with a raised seal, it was only a short form, not a long form, so they would not accept it. Apparently, what we both have seems to be the same kind of short-form birth certificate that President Obama originally released that the "birthers" had a cow over until he released his long-form birth certificate. We're mailing out requests to the City of Buffalo Clerk's Office to get official, certified, long-form birth certificates today at $10 a piece. That makes the running total cost so far $186, and we've completed just a handful of steps. And that doesn't include the money I've spent over the past few years filling in the basic genealogical information with ancestry.com subscriptions.